House Homemade: Rug pads are a must! Who Knew? Rug pads are a must! Who Knew? Hope you're having a great week so far! Today I want to talk to you about something that's not so glamorous but very necessary to your area rugs needs. Y'all, I had no clue how much of a game changer rug pads would be. We live in a house of ONLY rugs so it's kind of ridiculous that I'm just now realizing this. Just before the holidays Rug Pad USA was generous enough to hook me up with 2 new rug pads. They came quickly and were wrapped up nicely. They came while I was out of town so my littlest Nickerbean decorated the packaging with stickers. As one does. If you look at their website you'll see that first of all, there are different kinds of pads depending on the floors you have and on the purpose of the rug. 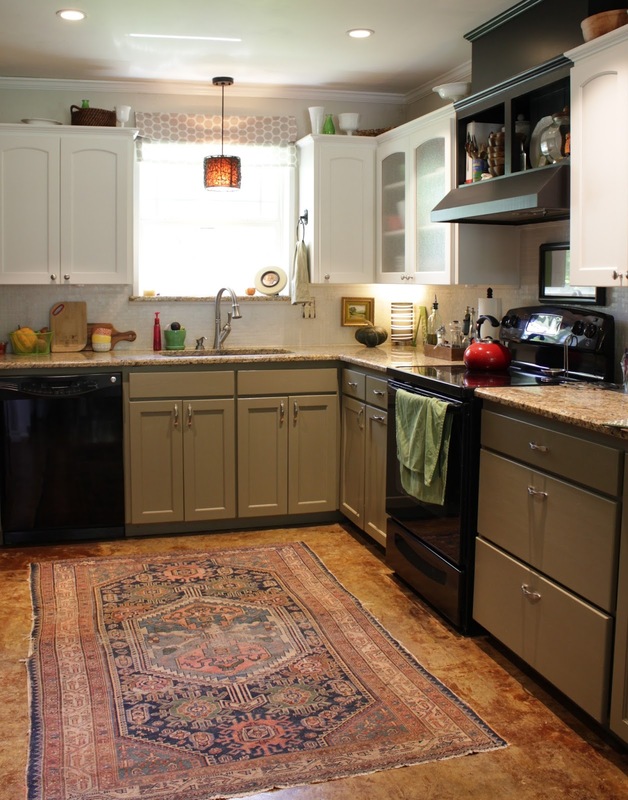 For example: I got a rug pad for the antique rug in our kitchen. In there, I didn't need cozy comfort. I needed us to NOT bust if we took the corner too fast. They suggested the contour lock rug pad and cut it to the exact measurements for our rug. I should say, we had a few of those waffle textured pads under this rug but not to the full size of the rug. Just cut up pieces in different spots. After having a real one, I can now say, that doesn't count.. It's great. It doesn't slip around, it's easier to vacuum and it's just plain safer. I should have protected this rug a long time ago. (You can read more about it here.) It's an heirloom so it's worth it. "Just as placing a rug pad preserves and shields your floor from damage, the use of an adequate pad prolongs the life, beauty, and strength of your rug. Proper padding serves as protective buffer against everyday friction that eventually degrades the quality of your rug." -from their website. Makes sense to me though. Turns out, the rugs "flaws" were totally because it just needed a good rug pad. Will, from Rug Pad USA suggested the superior lock rug pad. And lo and behold, it stopped happening. This is when I became a believer. We removed the rug(s), swept and laid down the cushy pad (with lots of invaluable help). It's awesome. We've had it down for about a month and a half and I haven't had to adjust it one time. Not. Even. Once. I couldn't be happier and I really wasn't expecting to feel that way. I have friends that have carpet and think area rugs won't work on carpet. I think area rugs work anywhere and are way easier to replace when they get nasty than ENTIRE rooms of carpet. If you want my help picking out an area rug, you let me know. If you already have an area rug on carpet and need a pad, you can find them here. Great news, too! They're offering a 5% coupon code to House Homemade readers. That doesn't sound like much but they almost always run a 15% off sale and my coupon is on top of that AND they offer free shipping so there ya go! A run on sentence and a great deal. Just use the code 'househomemade' when you check out. Honestly, I'm considering using my own code to buy a couple more. I received the rug pads from Rug Pads USA in exchange for a post. All 'fan-girl' opinions are my own. Thank you for supporting businesses that support House Homemade.